Today, author Kate Moretti describes how she has taken tidbits of her life and spun them into fiction. What’s her simple answer? Because it’s interesting! Frankly, it’s one of the best explanations I’ve heard. 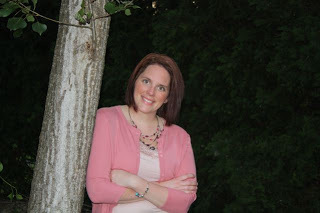 Please welcome Kate Moretti to Women’s Fiction Writers! In high school, I took a creative writing course. The teacher had us keep two journals – one of fiction, poetry, short stories and the like, and the other of our daily lives. I quickly filled the fiction one, but the daily one bored me to death. For fun, I started making up stories about my days. Who would know? In my made-up journal, the cute boy talked to me, or didn’t. Or I fought with my mom, or didn’t. It didn’t matter. The fictional day was no less mundane than my regular day, but the attraction was inventing it. Whatever happened that day, I’d write the opposite. Sometimes I’d make my alter ego have a wonderful day if I was having a particularly crappy one, but that’s as fantastic as I got. When I would get the journal back on Monday, I would page through, looking for the teacher’s comments. She’d write “Nice!” or “Fun!” next to one of my invented activities, and I’d feel a sense of pride. Which parts of my pretend life most entertained her? Later, as an adult, I would puzzle over the purpose of it — pages and pages of these pointless little white lies. As a reader, I’m no different. I’m attracted to different sides of the same coin. I seek out the character who could be me through the looking glass. I want to be able to submerge myself in the character, see their surroundings, or in some cases, superimpose my own life, my house, my husband, my kids into the novel. I want to imagine myself there. It was no surprise then that my debut novel featured a character who was suspiciously familiar to my family and friends. Claire Barnes, the main character in Thought I Knew You, is so much like me that those closest to me naturally extrapolate these similarities. Claire’s mother must be my mom. Her best friend must be my best friend (well, okay the names are the same! But that was more of a hat-tip than anything), her husband, a bit of a cad, must be my husband. I even had someone ask me once if the love interest was an ex-boyfriend! What? No, listen people: Love triangles are just plain interesting, okay? I think some writers, particularly in their first novel, who are learning how to develop characters, or expose unique fissures in relationships, will take large chunks of real life and add just enough fantasy to capture an audience. Just plain fact is boring. What did I do today? Wake up at five a.m., commute an hour to work, put in a long day, commute an hour home, pick up the kids, dinner, bath, bed… are you still awake? On the other hand, pure fantasy is unbelievable. If I said I hopped on a spaceship and saved the world from war mongering aliens, you’d disengage because you haven’t bought into it yet. You can’t see yourself there. Particularly if the saving all of humanity didn’t involve any emotional battles, just physical ones. The blur between what I can dream up and what I know from experience is the sweet spot where the most captivating stories are told. This might mean that a conversation with my sister will show up in a novel, larger than life. Or a disagreement with my husband will be tweaked or expanded, assigned more meaning than it had at the time. But truthfully, if the main character in the book pivots her life on this argument and leaves her husband, does it mean I will do the same? The best parts of writing are taking the mundane activities of your day and spinning fiction from them. It doesn’t have to be outlandish fiction, with wild plots or flamboyant characters. Instead of slamming the door, going for a drive, and coming back for an apology and some make-up nookie, what if I had just kept driving? Ended up in California, started a new life, became a famous actress or witnessed a murder? Does this somehow express some hidden desire? Nah, but my hope is that you turn the page, read to the next chapter. To me, I’m still writing those same journals from high school. I’m recording small pieces of my life, enhanced. Not necessarily better, but bolder–now in Technicolor! The conflicts are more dramatic, the resolutions are happier, the relationships more complicated. I’m still writing for my own enjoyment because I have stories in my head that need to be told. But unlike high school, I’m trying to entertain a slightly larger audience. To keep you turning the pages. As a writer, that’s all we ever want. 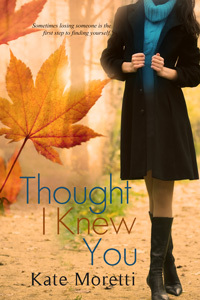 Kate Moretti is the author of the contemporary romance, Thought I Knew You. She lives in Pennsylvania with her husband, two kids, and a dog. She’s worked in the pharmaceutical industry for ten years as a scientist, and has been an avid fiction reader her entire life. She enjoys traveling and cooking, although with two kids, a day job, and writing, she doesn’t get to do those things as much as she’d like. Her lifelong dream is to buy an old house with a secret passageway. You can connect with Kate on facebook at http://www.facebook.com/katemorettiwriter. I agree with spicing up your life for fiction. While my character in ‘The Divorced Lady’s Companion to Living in Italy’ is divorced and lives in Italy, she has WAY MORE fun than I have had raising four kids and living in the countryside. I also take bits and pieces, imagine things, listen to stories and have a wild imagination. Writing that book was one of the most fun things I’ve ever done and made me look at Italy in a new way! So I say Go! with borrowing bits of your life and expanding them into something different! Great cover and title and good luck! It is so much more interesting to read about a character you can relate to even if only in a small way. I like to mix it up a bit too–a dash of truth here and a sprinkle of what-if….loved the article and congrats with Thought I Knew You. Thank you, ladies! And thanks Amy for hosting me on WFW. I’ll be stopping in to chat throughout the day :). Great post, Kate! I’ll have to show it to my husband so he’ll understand why sometimes, just as we’re about to turn out the lights at night, I have to snap mine back on and scribble madly in my journal to capture one last bit of conversation or description of the day. I’m hardly a novice writer, but I’ve learned these scribbles come in mighty handy when I’m stuck for ideas, and can even generate an entire novel. I definitely don’t do that as much as I should – record daily events, etc. And I bet they would be fantastic for brainstorming.Thanks for reading! I think first novels almost always contain a big chunk of personal experience–we write what we know but we also, as fiction writers, what to expand and dream and take the story farther than what we have experienced. Don’t you find that some of your characters have their roots in people you know, but they grow and change as you write about them? Thanks for a great post. Yes, constantly! I think I start out with a model of someone I know well/love and then even take those outstanding personality traits and highlight them. Sometimes, this gets me in hot water. In TIKY, the mom is a bit overbearing. We’ll just say that I think my mom wondered… 😀 Thanks for stopping by! Kate I love the cover of your book! Congrats on your debut. You sound like you were a lot of fun in high school (or at least you thought you were, lol). Rather than base my characters on people like you, I based them on the people I’d like to know, I think. I like it when each character has a relatable motivation, but goals that put them into conflict. Thanks for sharing your journey here!